Above is Part 3 of ISSCR's video blogs from the 2013 ISSCR annual meeting. This video introduces the fascinating research in cell-based CNS repair done by Dr. Christoph Pröschel. Dr. Pröschel’s most recent work has focused on using human glial progenitor cells to repair damage to the CNS caused by spinal cord injury. In a 2011 study published in PLoS One, Dr. Pröschel and colleagues describe how human glial precursors were able to restore motor function to spinal cord-injured rats. In our interview, Dr. Pröschel explains the difference between replacement and repair in cell-based regenerative medicine, a theme that fellow spinal cord injury researcher Dr. Aileen Anderson of UC Irvine also frequently touches on. In our video, Dr. Pröschel also has some remarks about direct lineage reprogramming. For the first time, scientists discovered that a specific type of human cell, generated from stem cells and transplanted into spinal cord injured rats, provide tremendous benefit, not only repairing damage to the nervous system but helping the animals regain locomotor function as well. The study, published today in the journal PLoS ONE, focuses on human astrocytes – the major support cells in the central nervous system – and indicates that transplantation of these cells represents a potential new avenue for the treatment of spinal cord injuries and other central nervous system disorders. We’ve shown in previous research that the right types of rat astrocytes are beneficial, but this study brings it up to the human level, which is a huge step, said Chris Proschel, Ph.D., lead study author and assistant professor of Genetics at the University of Rochester Medical Center. What’s really striking is the robustness of the effect. Scientists have claimed repair of spinal cord injuries in rats before, but the benefits have been variable and rarely as strong as what we’ve seen with our transplants. 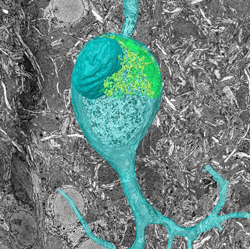 To create the different types of astrocytes used in the experiment, researchers isolated human glial precursor cells, first identified by Margot Mayer-Proschel, Ph.D., associate professor of Genetics at the University of Rochester Medical Center, and exposed these precursor cells to two different signaling molecules used to instruct different astrocytic cell fate – BMP (bone morphogenetic protein) or CNTF (ciliary neurotrophic factor). As far as Mark Noble is concerned, the next medical revolution arrived more than 30 years ago. That’s when the Rochester professor of biomedical genetics and scientists like him at academic medical centers across the country first began to grasp the potential of stem cells. In Noble’s lab and in the labs of scientists across the Medical Center, Rochester scientists have been exploring that potential for several years, helping lead research projects focused on new cancer treatments, the role nutrition plays in early development, and in understanding how to repair damage to the brain and nervous system. Chris Proschel, Mark Noble, and Margot Mayer-Proschel have worked together as a team since 1990. They played key roles in identifying—and are considered to be among the best in the world at handling—the four known progenitor cells for the various cells found in the central nervous system.